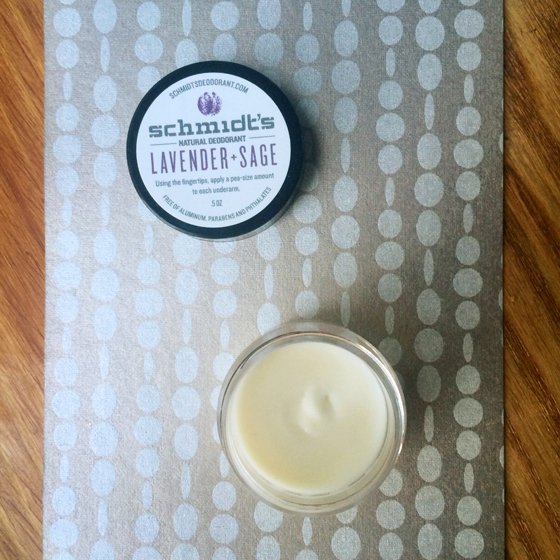 Schmidt’s Lavender + Sage scent hit it out of the park for me and is definitively my new go-to, 100% natural deo. It is hands down the best I’ve tried. How’s that for high praise?! A number of natural deodorants I’ve tried have irritated my underarms a bit and have just been “okay” at stopping sweat. But Schmidt’s…you have cracked the code. Not only does this deo wear all day for me with virtually no sweat, it smells delightful. 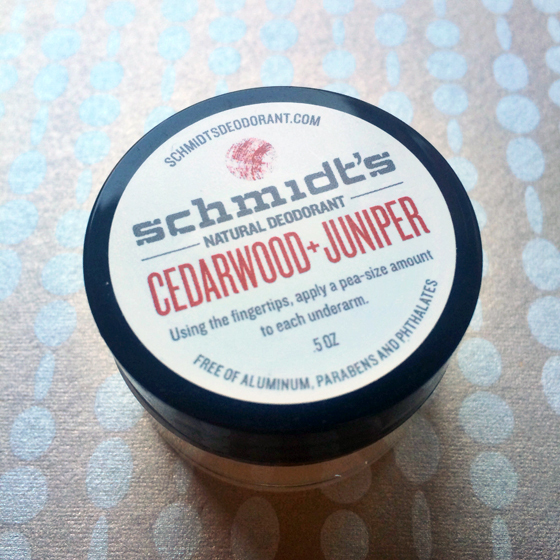 My runner-up scent is the Cedarwood + Juniper, which screams “MANLINESS” to me. It’s woodsy and spicy. But hey, I’ve always liked the smell of dude deodorant, and what’s the deal with gendered scents, anyway? The Ylang-Ylang + Calendula is very gentle and subdued (I dig it, also), but the Bergamot Lime is unfortunately too sweet for my liking. I like a basic, simple scent in the deodorant realm. And, hey, if you like the UTMOST in simplicity, opt for the fragrance-free Schmidt’s! You’ll need a small spatula applicator to apply Schmidt’s Deo, as the consistency is fairly hard and not quite a spreadable paste, like other natural deodorants I’ve tried. But the extra effort is worth it. This. Stuff. WORKS. Smell me, I dare you! 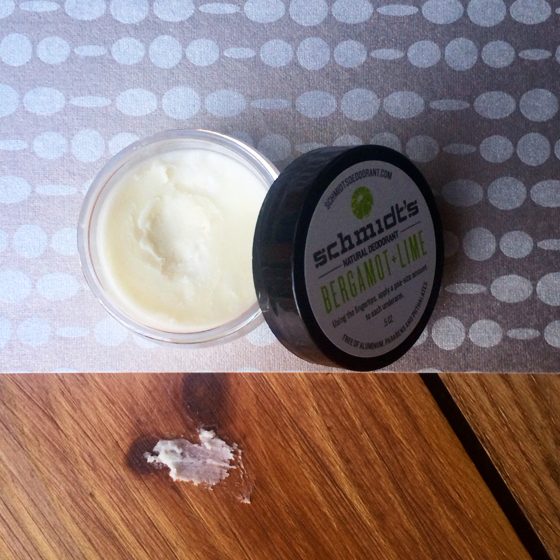 Schmidt’s is a brand that was initially sent to me in a Petit Vour box (vegan beauty box) this summer. I received the Lavender + Sage scent and was truly dazzled by not only the hint of calming lavender that radiated out of the pot, but the fact that the ingredient list is truly up to standard for a green bunny like myself! After experimenting with all the scents more recently, I was drawn immediately to the bright Bergamot + Lime – it is has the strong smell of a lime hard candy, and just makes me very happy. It is unapologetically sweet smelling, and as with all the Schmidt’s pots, has a melting quality as you apply it to your underarms. I like to apply right after getting out of the shower. As far as staying power, odor fighting capabilities, and how it protects against sweat/wetness: I was pretty impressed. I don’t ever reapply it, just once is fine for the whole day. Of course, this is a natural deodorant, so it won’t stop moisture all together, but it certainly beats the alternative of containing toxic nasties like the mainstream anti-perspirants. There are just some truths you will have to be OK with when it comes to an all-natural beauty regimen. I adore all of the scents: the Cedarwood + Juniper would work especially well for the man in your life due to it’s earthy tones, so I would certainly not shy away from gifting this! The Ylang-Ylang + Calendula is also one of my favorite scents, and is so lovely to experience in the morning. I don’t even feel the need to apply a natural perfume when wearing Schmidt’s because it provides you with a subtle fresh waft that lasts pretty much all day. It is worth noting that I have quite sensitive skin. I have thin, paper-y, redness prone skin, especially under my arms. Sometimes baking soda-based deodorants can be irritating for me. So, just a little disclaimer that if you have a sensitivity to this as I do, I would recommend that you use the product once per day without reapplying, and give your underarms “rest” days when you just use some coconut oil and let your stink flag fly. It’s just the name of the game when you have finicky armpits. I use Schmidt’s about five days a week, and it’s working quite well. All about the balance, yes? 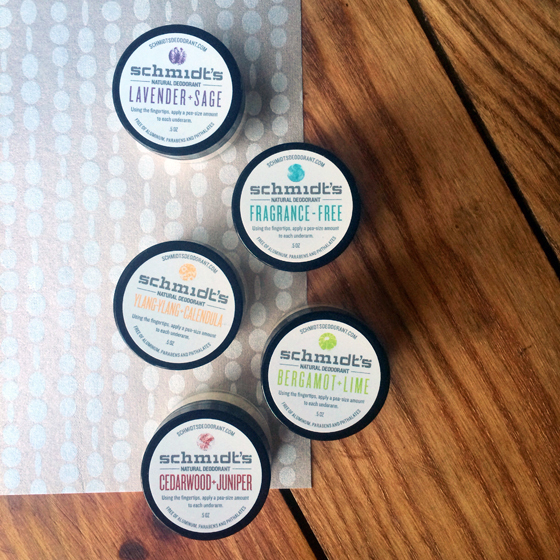 **All Schmidt’s Deodorant samples were generously sent to us for review by the product manufacturer. Check out our policy on product reviews. Heard enough about all-natural deodorant? We hope not! Come back tomorrow for our Q&A with the ever-knowledgable Schmidt’s Deodorant founder Jaime Schmidt. Sabrina’s been trying this out from the Petit Vour box and loving it! And they all look so perdy….